iPage Review 2018 – Good Cheap Hosting or Not? Read this first! July 14, 2017 October 9, 2018 learnanetLeave a Comment on iPage Review 2018 – Good Cheap Hosting or Not? Read this first! So it’s been 1 year and now I want to give you guys some feedback on them today.. If iPage is a foreign language to you, it was for me also before hearing about them. I quickly discovered that it was a super cheap web hosting that offers several products. Things like dedicated hosting services, VPS and shared hosting services. In this iPage review 2018 I will cover..
Is iPage good to start your new website or not? iPage web hosting is another one of the many other web host own by Endurance International. While EI has been on the scene for 2 decades, iPage has managed to host some 1 million sites on their platform and know mostly for its web hosting under $2! I won’t talk too much about how large of a company Endurance International is as they are huge conglomerate that owns a lot of web hosts, rather focus in on how this little guy iPage is doing. Disclosure: This page contain affiliate links. When clicked and a purchase is made, the owner of this will receive a commission. This is how I pay the bills. This doesn’t affect your purchase at all. You can get the best discount by clicking on them. Why You Need This iPage Review 2018? There are many web hosts out there as you may already know, but today I am reviewing iPage because I love simply to build small websites for friends use their services. Secondly, I am reviewing them because there are not many hosting services (if any) under the 2 dollar threshold. With a price point like $1.99/month, other competitors don’t stand a chance. Although Bluehost, Siteground, Inmotion run about $3.95/month which is still not bad, iPage still knocks them out the ball park at a 75% savings! So I started an account with iPage some time ago to compare them with my other 3 hosts. One of the things that I noticed is that iPage web hosting performs very well and is pretty fast. Also, there are a lot of plugins and features that make it more user friendly. I don’t want to bore you, but this iPage review 2018 will reveal later how I really feel about their service and why you should consider them today. They have been around 1998 and since then have grown the forces to now powering well over 1 million websites. This means that they tons of experience under their belt and know what they are doing in the web hosting industry. So iPage offers a 30 money back guarantee on their hosting services if you are not 100% satisfied. This means that it is risk free and that they stand behind a quality product. Now in this iPage review I want to discuss something that really impress me and that’s customer service. The reps respond in a timely manner with tickets and chat. They always take care of any inquiries and issues 24/7. Knowing that someone is always there to assist is always great to know. You can call direct at 877-472-4399 or use the chat support. In case you missed it in the beginning, the hosting plans are now discounted at $1.99/month at 36 months! This huge discount here is great for all budgets. 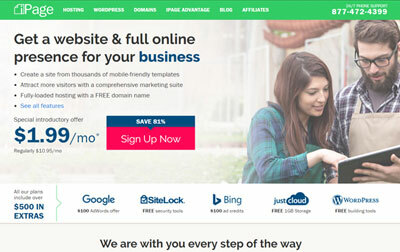 Although cheap, the hosting plans have with unlimited bandwidth, domain names, disk space, site builders, cms platforms wordpress, joomla, drupal, etc. If you have site that get lots of visitors, then the WP Essential plans is better. They have a very special version called “control panel”. When comparing it with other platforms such as Bluehost, Hostgator, InMotion or Siteground, iPage’s is very unique. See below. So if you are familiar with these previous hosts, then you will see that you have access to the same SEO features, although different using back office called control panel. Unlike these aforementioned, iPage does not have cpanel which is a bit of a downer. Their control panels have many basic features that allow you to do the same things, however different from the typical cpanel backoffice with WordPress that most are accustomed to. What are the Pros of iPage Hosting? One of the #1 things that you will notice about them when comparing to others is that they are super inexpensive at only $1.99 per month. This I have to be affordable for all pockets. Besides free web hosting, there is only one other web host cheaper than iPage. At 3 years, this works out to be only $71.64 or $23.88/year! In my personal findings while comparing the hosting accounts that I have, this is the best value. As mentioned above, their customer service is good. Any Cons of Using iPage Hosting? Although I convinced that they good for beginners who want to start a new website, there are just a few cons that you need to know. So far starters, you already know that the hosting plans start at $1.99 per month which good. Although you get a 100% refund if dissatisfied within the 30 day window, it doesn’t any add-on services. Also, there is a $15 non-refundable fee for your domain. This is good if it’s a great domain and want to transfer it to another host, but a lost if you no will use it. Also, let’s say you the introductory deal at $1.99 per month and buy hosting for 36 months, when you renew it will revert back to the normal rate of $7.99 per month! Wowza, that’s 4 times the rate slightly over Dreamhost at $7.95! But hey at least it’s not WP Engine pricing! When it comes to uptime they are pretty good, but could be better. But no web host is 100% perfect when it comes to this. Some boasts 100%, 99.99, 99.98 % uptime, but that’s not always the case. Some months are good with others are not so good. iPage is no different, but a good host for the price point. However, web hosting companies like Bluehost, Siteground and Hostgator are way better for uptime. Ok so in this iPage review 2018, let me talk about some more freebies I discovered that iPage will give many freebies and other features. To get your new site off to good start online you will get access to $100 Adwords credit, $50 Facebook & $50 on Yahoo and $100 Bing networks. I have used all of platforms and it’s definitely worth it. Once you optimized your site and pages, I think that these are great to use to get some quick traffic & exposure to your website after it goes live. Conclusion: Should you get started with iPage? As mentioned throughout this iPage review 2018, ipage web hosting is super affordable for all budgets, reliable, secure and great to start your new website. I definitely recommend that you give them try today, but of course that’s just my opinion if you are on a small budget for your business. Remember that they do have the 30 day money back guarantee if you are not satisfied. In this iPage review 2018, I have tried to give you all of the basics to consider to determine if iPage hosting plans are for you or not for this coming year. Now I have a few questions that you can answer below. Before reading this iPage review, have you ever tried them before? If so, what do you think about your current or past experience? Time to hear your thoughts below..
Visit the official ipage website to signup here! Previous Post Previous post: mysteryshopperonlinejob.com Review – Scam or Legit? Read this First! Next Post Next post: Anjelah Johnson Youtube Reviewed: Anjelah Johnson at Funny Bone Comedy Club!